PRICE PER 1.8m LENGTH per full length 1.8m with the price coming down for shorter lengths. Cast iron rain pipe selection, there are various different diameters and styles including ogee and half round in stock. Our selection of down-pipes is wide and varied. Our stock is constantly changing with new stock regularly coming in. 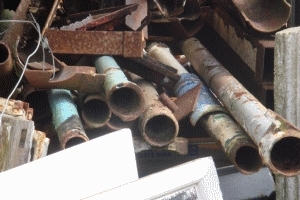 If you want to ask any questions about these cast iron down-pipes or any other types of guttering we have in stock, then please call us at Ace Reclamation on 01202 579222. Or if you'd like to know about specific pieces either visit us or E-mail us Feel free to come and visit our yard in West Parley and have a browse through our stock. Staff are always available to give you a hand and show you around our stock.